FILE - A plastic bottle washed up by the sea is seen at the Ao Phrao Beach, on the island of Ko Samet, Thailand, June 10, 2018. For the millions of sun seekers who head to Thailand's resort island of Phuket each year in search of stunning beaches and clear waters, cutting down on waste may not be a top priority. But the island's hotel association is hoping to change that with a series of initiatives aimed at reducing the use of plastic, tackling the garbage that washes up on its shores, and educating staff, local communities and tourists alike. "Hotels unchecked are huge consumers and users of single-use plastics," said Anthony Lark, president of the Phuket Hotels Association and managing director of the Trisara resort. "Every resort in Southeast Asia has a plastic problem. Until we all make a change, it's going to get worse and worse," he told the Thomson Reuters Foundation. Established in 2016 and with about 70 members - including all Phuket's five-star hotels - the association has put tackling environmental issues high on its to-do list. Last year the group surveyed members' plastics use and then began looking at ways to shrink their plastics footprint. As part of this, three months ago the association's hotels committed to phase out, or put plans in place to stop using plastic water bottles and plastic drinking straws by 2019. About five years ago, Lark's own resort with about 40 villas used to dump into landfill about 250,000 plastic water bottles annually. It has now switched to reusable glass bottles. The hotel association also teamed up with the documentary makers of "A Plastic Ocean", and now show an edited version with Thai subtitles for staff training. Meanwhile hotel employees and local school children take part in regular beach clean-ups. "The association is involved in good and inclusive community-based action, rather than just hotel general managers getting together for a drink," Lark said. Phuket, like Bali in Indonesia and Boracay in the Philippines, has become a top holiday destination in Southeast Asia - and faces similar challenges. Of a similar size to Singapore and at the geographical heart of Southeast Asia, Phuket is easily accessible to tourists from China, India, Malaysia and Australia. With its white sandy beaches and infamous nightlife, Phuket attracts about 10 million visitors each year, media reports say, helping make the Thai tourism industry one of the few bright spots in an otherwise lackluster economy. Popular with holiday makers and retirees, Phuket - like many other Southeast Asian resorts - must contend with traffic congestion, poor water management and patchy waste collection services. Despite these persistent problems, hotels in the region need to follow Phuket's lead and step up action to cut their dependence on plastics, said Susan Ruffo, a managing director at the U.S.-based non-profit group Ocean Conservancy. 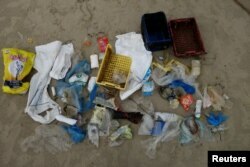 Worldwide, between 8 million and 15 million tons of plastic are dumped in the ocean every year, killing marine life and entering the human food chain, UN Environment says. FILE - Plastic items washed up by the sea are seen at the Ao Phrao Beach, on the island of Ko Samet, Thailand, June 9, 2018. Five Asian countries - China, Indonesia, the Philippines, Vietnam and Thailand - account for up to 60 percent of plastic waste leaking into the seas, an Ocean Conservancy study found. "As both creators and 'victims' of waste, the hotel industry has a lot to gain by making efforts to control their own waste and helping their guests do the same," Ruffo said. "We are seeing more and more resorts and chains start to take action, but there is a lot more to be done, particularly in the area of ensuring that hotel waste is properly collected and recycled," she added. Data on how much plastic is used by hotels and the hospitality industry is hard to find. But packaging accounts for up to 40 percent of an establishment's waste stream, according to a 2011 study by The Travel Foundation, a U.K.-based charity. In the past, the hospitality industry has looked at how to use less water and energy, said Von Hernandez, global coordinator at the "Break Free From Plastic" movement in Manila. Now hotels are turning their attention to single-use plastics amid growing public awareness about damage to oceans. "A lot of hotels are doing good work around plastics," adopting measures to eliminate or shrink their footprint, said Hernandez. But hotels in Southeast Asia often have to contend with poor waste management and crumbling infrastructure. "I've seen resorts in Bali that pay staff to rake the beach every morning to get rid of plastic, but then they either dig a hole, and bury it or burn it on the beach," said Ruffo. "Those are not effective solutions, and can lead to other issues." "Over time, this could actually lower their operational costs - it could give them savings," said Hernandez. "It could help change mindsets of people, so that when they go back to their usual lives, they have a little bit of education." Back in Phuket, the hotel association is exploring ways to cut plastic waste further, and will host its first regional forum on environmental awareness next month. The hope is that what the group has learned over the last two years can be implemented at other Southeast Asian resorts and across the wider community. "If the 20,000 staff in our hotels go home and educate mum and dad about recycling or reusing, it's going to make a big difference," said Lark.